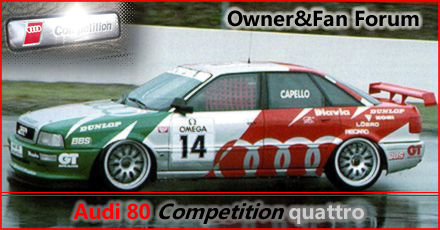 Audi 80 Competition Forum :: Forum Intro and new members. Neue Mitglieder Willkommen! 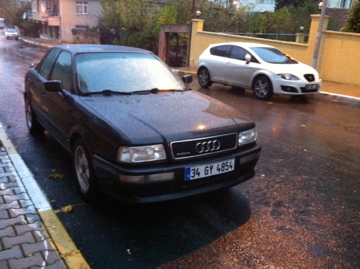 today i bought a 1994 audi 80 2.0L 16v it says 'competition' on the dash board. i wonder how can i really be sure it is a compi? is there a way to identify these limited edition compis? one easy and quick way to know for sure if it is a genuine compi is to look on the back side of the fuel tank door. the compi is the only audi 80 to have stock 16" wheels and tyres, on the back of the fuel tank door you have the tyre specs written. so if it is a compi, you will have 205 55 16 tyres listed there. i know that tires are 205 55 16 right now, i will check the fuel tank door tomorrow..
i lifted the car today and made a check with the mechanic; i have a long list of parts need to be changed , most importantly the engine it self. its pouring oil from everywhere. but generally the car is in good shape..
is there any other way to find it?